Opening with a call-to-arms for anyone that has been frayed by the occasional aggressiveness of Animal Collective's assault‚ "You Can Count On Me" is a welcoming assurance to the listener that even at its most intense apex‚ Tomboy will maintain the bliss and rapture that is sometimes lost when Panda Bear (aka Noah Lennox) is teamed with his cohorts. In other words‚ if the really freaky Animal Collective tunes rub you the wrong way but you like their lofty‚ dreamy stuff‚ then you'll love Lennox left to his sole desires. 2007's Person Pitch was a huge step forward in the world of drone-pop‚ as Panda Bear seamlessly mashed the worlds of My Bloody Valentine and Brian Wilson into one natural star-child of the new millennium. Suddenly‚ a whole new generation of kids realized how cool it was to take your echo-pedals to the beach. But with all the new dream-pop‚ drone-tweak‚ self-layered Beach Boy harmony crafters out there‚ no one has been able to match the pocket that Lennox melted into 4 years ago. And luckily for all of us‚ he never left it. Perhaps crafting a new mold for pre-album single-track releases‚ both "Slow Motion" and "Tomboy" are slightly revamped and extended from their drops earlier in the year. It seems perfectly simple: if you still want people to be excited about an album after you've already given away some of the tracks‚ then give those tunes a tweak so as to refresh your devoted fans' ears. The extensions on these tunes are essential though -- the heart of Panda Bear's magic lies in the multi-layered‚ rhythm loops that pulse and breathe at his outros. 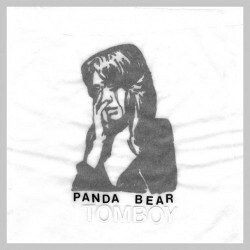 On "Tomboy" especially‚ the deconstructed gallop and acceptable synth overload sound like your nervous heart beating as it approaches a UFO crash-site in the woods -- that good kind of nervous. Lennox's vocals are intentionally more blurred than ever -- taking a cue from his old label mates in Sigur Ros‚ his voice is used as a melodic and emotive tool‚ rather than a strict lyrical one. On the aptly title "Drone‚" word fragments rear their heads to a faint access‚ but not enough to fully comprehend one of his new Western mantras. On "Friendship Bracelet" he makes Thom Yorke sound like Maya Angelou‚ but there's still a sense that you somehow know what he's talking about. That is the essence of his blessed enigma though: the hidden and implied are actually the focus‚ not the melody and rhythm. Just as on "Surfer's Hymn" and "Last Night at the Jetty‚" where Panda Bear channels the true essence of Pet Sounds without formulaically sounding like any of that album's music. This quasi-organic‚ half-digitized self-layering pattern shouldn't work anywhere near as well as he makes it‚ but again‚ that's all part of the allure -- embrace the escape. If you listen really closely to the ending growth-pocket of "Bracelet‚" there's a moment where you completely forget who you are. Tomboy calls for the listener to lose themselves‚ and Lennox has proven again that you're safe to do so in his hands.